We sell HEAPS of Optimas. Why does this matter? Because our turnover is so high, our batteries are always fresh! No aged-stock! Authorized Seller - We buy direct from the importer so we can offer a full Warranty and fast after Sales Support. Our Stores get fresh stock weekly. Beware obsolete stock & and sellers with a "No returns policy"
We offer our 100% Satisfaction Guarantee - Buy Online, in-Store or by Phone. Choose the Yellow Top Optima when you need Deep Cycle capability for say Lighting, Stereo systems or a small fridge, plus high cranking amps for vehicle starting. View the Yellow top Optima range. Choose the Red Top Optima for maximum vehicle Starting capability, when high CCA's & toughness are required, and deep cycle capability is NOT needed. View the Red top Optima range. Choose the Blue Top Optima for Marine Applications needing high cranking amps along with deep cycling (all except the D34 dark case which is Starting-only). View the Blue Top Optima range. Optima Batteries feature Absorbed Glass Mat (AGM) design and spiral construction for high vibration resistance & rapid charging. Fast charge if temperature is monitored! Optima Batteries - Buy Online or collect from our Melbourne or Launceston Stores. 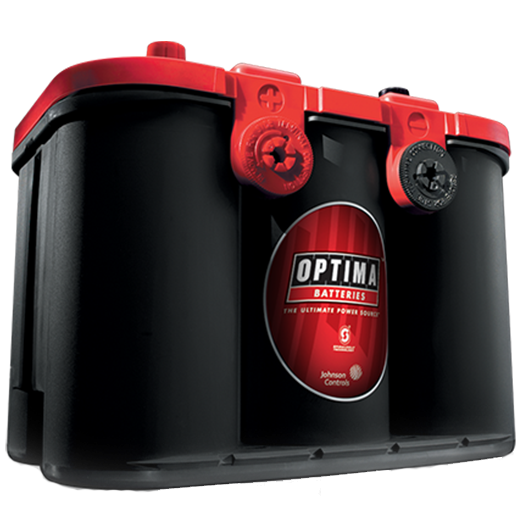 At "Every Battery" we sell the full range of Optima batteries. You can buy Online and collect from store, avoiding the delay in receiving your purchase, just call us before travelling to make sure your nearest Store has your Optima in stock . Want a cheap Optima battery? We only sell high quality batteries from the best manufacturers, but we always sell more cheaply than the competition, and we provide high levels of support from our Stores. Our high turnover means we have the freshest stock, and by filling in your order online you can help us keep the costs and prices down. Optima Batteries have a 10 year design life. With exceptional build-quality, Optima Batteries suit 4WD (big winches! ), Custom cars (big ICE /audio) Race-cars, Boats, Tractors, Trucks, RV's, Taxi's etc. Mining and Digging equipment often use Optima Batteries and you will find Optima's wherever there is a tough application. If you want long life batteries - try Optima! The Optima Battery spiral cell design with the plates wound tightly around a central cylindrical core gives exceptional vibration resistance and toughness. Optima Batteries have high cranking amps combined with cycling capability (in most Blue and Yellow top models), making them an excellent choice for extreme applications. If you regularly kill batteries you need to try Optima! The Optima Battery is maintenance-free and spill-proof courtesy of their Absorbed Glass Mat (AGM) design. Customers are often surprised by how quickly their Optima Battery will recharge. Example, a D27F Optima Yellow Top charges in 35 minutes from flat at 100 amps! If you need fast charging while on the water or for 4x4 winching then you need to try Optima! Optima Batteries are non-gassing under normal conditions, and they have up to a 3 year warranty depending on type & application. See individual Optima Battery links above for more details.